One of the most exciting features of Urswick Church is that the various building phases, developments and to some extent, the social history of many generations, can still be clearly seen in the ‘fabric’ of the building. The claim that it is probably one of the oldest churches in England to have had continuous worship is not without foundations. On going archaeological and historical work related to its origins (see ‘Beacon on the Bay’ by Steve Dickinson) suggests strongly a Christian presence and some sort of ‘church’ building in the Romano-British period (Roman artefacts, parts of a dedication stone, and masonry built into the walls confirms such a claim); a recently uncovered ‘foundation stone’ again suggests a very old establishment as does the presence of the ‘Trumwinni Cross’ which has been dated to about the 7th century at the latest. As time goes on more might be revealed about the earliest period of its existence although evidence is hard to come by considering the nature of materials used in those days. We have also clear evidence of Christianity here during the Viking years (again, a cross fragment can be seen in the church today, having been discovered built into the chancel wall during renovations in about 1910). 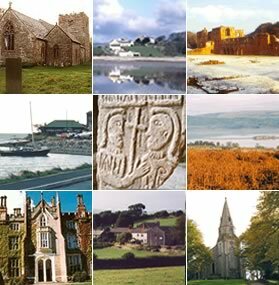 The fact that many of these pieces represent several periods perhaps supports a spell of restoration and rebuilding using local materials at about the time of the coming of the Normans. The statement by Thomas Urswick in a book he wrote about the ‘Records of the Family of Urswyk, Urswick, or Urwick’, edited by Revd. William Urswick and published in 1898, that ‘on the top of the hill which overlooks the deep Tarn by the shores of which the village stands, and peeping from the woods which then clothed its brow, might be seen the massive ruins of a rude fortress, probably of ancient British origin; a mere heap of stones had it become, but it was useful whereupon to raise one of those numerous beacons so necessary to give warning of the approach of the Scots and other marauding tribes’ could of course refer to the old hill fort, but there is no evidence to date to support this. A significant strengthening of the church and its tower perhaps makes more sense. What is clear is that when Furness Abbey was founded in 1127 by the Charter of Stephen, Earl of Bologne, including all of his possessions in Furness with the exception of those lands owned by Sir Michael le Fleming; Sir Michael gave to the Abbot two coastal villages ( Ros and Crivelton) in exchange for the manors of Bardsea and Urswick. Urswick Church was not included in this transaction because the Abbot had already bestowed it upon his son-in-law, Daniel. A guide to the Parish Church of Urswick written by L.Pollitt in 1977 draws much on the work of the Revd. T N Postlethwaite published in 1924 and gives us several helpful glimpses of the different phases of building. He states that ‘outside the church, along both the north and south walls of the nave, can be seen a series of regularly spaced holes at a height of about two thirds of that of the present walls. These holes ( arch-holes) may have supported light timbers which carried a steep roof, possibly made of reeds. Later the walls were raised and windows inserted. The masonry below the arch-holes is if a noticeably crude character’. The church was re-roofed in 1598. The Tower was probably an addition to the original church, ‘the lower part pre-Norman’ and would have been low and squat and possibly saddle-backed. It would have been a pele tower used to protect the local settlers and their animals. The Tower was built higher during Tudor times and the embattlement and buttresses added. High up on the west front of the Tower are three niches, the left hand one contains a time-worn Mater Dolorosa, a depiction in red sandstone of the Virgin Mary with the dead body of Jesus in her arms. 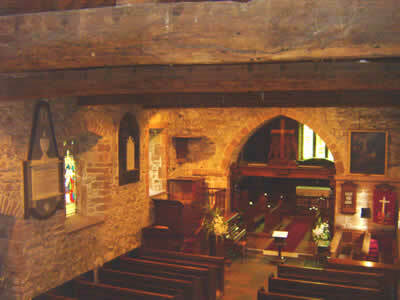 The porch and the chancel were further additions to the original structure; their walls are not bonded into the nave which supports this supposition. Pollitt suggests that the chancel wall was either pierced in the East wall of the nave or raised from an existing apse. In 1751 a ceiling was constructed and the oak beams covered up and the walls plastered. When renovations took place early in the 20th century the oak beams were exposed and also some suggestion of coloured murals on part of the nave walls which had been covered up by the plaster; they were too poor to retain! A gallery pew (known as the Gale pew) was erected by Christopher Wilson of Bardsea in 1759 and the pulpit moved across to the north side of the church. In 1828 drastic renovations took place, the chancel being in a ruinous state; consequently the top portion of the walls were rebuilt and timber put into the roof. The chancel flooring was also relaid with Hutton Roof (near Kendal) flagstones. The West Gallery was inserted and the old irregular oak seats replaced with uniform pews. The Three- decker pulpit, of Georgian origin, was moved to the north side of the chancel arch (and to its current position in 1907). The tiled reredos which had been made in 1840 was removed from the east wall in 1907 and the present oak panelling put in. For some reason the original font (now restored) was removed from the church and ‘stored’ in the garden of William Cranke, being returned at the beginning of the 20th century, Its oak cover in memory of Henry Richmond Houghton Gale and his wife Emma, has the heads of their four daughters depicted in the centre; this is dated 1921. A very distinctive feature of the reordering at the beginning of the 20th century is the wonderful craftsmanship in wood, much of it executed by Alec Miller of the Chipping Campden Guild of Craftsmen and donated by Miss Petty of Ulverston in memory of Thomas Shaw Petty of Well House, Bardsea. Revd. 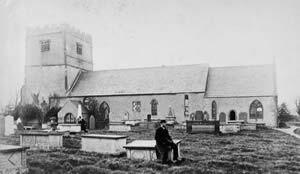 Thomas Edmund Petty, formerly of London (hence perhaps the link with the Chipping Campden Guild which originated in London) had purchased and had been responsible for completing the building of Holy Trinity church, Bardsea. He was its first curate-in-charge. His sister endowed Bardsea School in 1852. Life in a church never stands still and again in recent years a significant restoration programme has been successfully carried out and a new heating system installed; currently plans are in place to refurbish the Tower, to reinstate the ‘bell ringers floor’ and to provide space in the Tower well for a permanent exhibition celebrating the life and the heritage of both church and community.